Usually I don't post new articles just because of new singles covers but my excitement over this release is too big not to follow every step of its arrival. So here we get title and cover of brand new single from eurodance-king E-Type - "Back 2 Life"!!! According to www.etype.nl new single will be presented on iTunes and Spotify of Sweden, Norway, Finland and Denmark soon with a later turn of other countries. No physical release of single planned but...oh my God! Just give us a first listen faster! If you've missed my previous post with information about E-Type's comeback check it here. 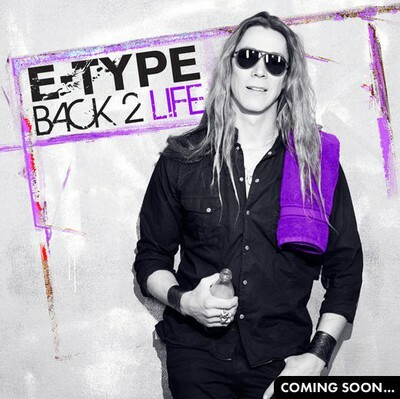 Update: Due to E-Type's blog single will be released already next Monday on January 17th! Update 2: 3 days before release! Popdrömmen reports that new E-Type's single sounds nothing like classic E-Type but more like mix of Taio Cruz and David Guetta! I physically can't wait to hear it. It has been a long time coming! ! ! My head just hurts!!!. Why, o why Martin, the Eurodance God, have made this crappy autotune popsong. ROTFIP(In Pain)!. I'm hoping that this was just an early April Fool's prank.